A US Customs official uncovers a money laundering scheme involving Colombian drug lord Pablo Escobar. Set in 1986, 2016’s The Infiltrator offers a glimpse of the American “War on Drugs”. Based on actual events, we follow the career of US Customs Agent Bob Mazur (Bryan Cranston). 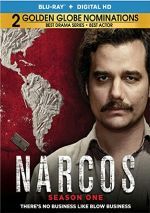 As Colombian drug lord Pablo Escobar’s wares flow into the country, the US government attempts to cripple his organization. Under the alias “Bob Musella”, Mazur infiltrates Escobar’s cartel and works to undercut the kingpin’s money-laundering schemes. That synopsis gives Infiltrator a much more concise, direct story than anything that actually shows up on the screen. While it aspires to tell a fairly simple plot, the end result tends to meander and lack much coherence or drive. At times, Infiltrator feels more like a conglomeration of cinematic allusions than anything else. Director Brad Furman wears his influences on his sleeve, so the film alternates among nods to the work of Martin Scorsese and Michael Mann. Actually, Infiltrator starts with a distinctly Scorsese vibe – or more like Scorsese as filtered through the Paul Thomas Anderson of Boogie Nights. Matters become more Mann as they progress and the criminal elements turn dominant. None of these factors allow Infiltrator to feel original or fresh, and the sloppy storytelling doesn’t help. Honestly, the film brings us less of a narrative and more of a loose collection of scenes. These build the semblance of an actual plot but the pieces come together in such a disconnected way that they don’t create anything involving. Don’t expect much support from the cast. While Infiltrator gathers a good roster of actors, they tend to over-emote – especially Cranston, who chews the scenery too much of the time. Not that I can blame him, as the limp story leaves the actors in the lurch. Cranston probably went “big” in hopes that he could distract from the rambling nature of the narrative. Maybe the series Narcos - which covers similar territory – raised my expectations for tales such as this. Whatever the case, The Infiltrator winds up as a dull experience. 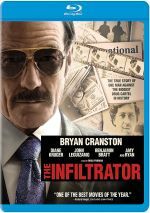 The Infiltrator appears in an aspect ratio of approximately 2.40:1 on this Blu-ray Disc. Don’t expect many problems from this positive presentation. Overall sharpness looked fine. A few wide shots looked a smidgen, but those occurred infrequently, so the majority of the flick came across as accurate and well-defined. Shimmering and jaggies failed to appear, and edge haloes remained absent. Print flaws also never popped up in this clean transfer. Infiltrator went with a stylized palette that favored big, garish tones. It used some of the standard orange and teal, but it also developed heavy greens and yellows. These looked solid within the flick’s design. Blacks seemed tight and dense, and low-light shots provided strong smoothness and clarity. Only the minor soft spots knocked this down to “B+” consideration. Though without constant razzmatazz, Infiltrator came with a reasonable DTS-HD MA 5.1 soundfield. It used all the channels to blast music at us, and appropriate effects cropped up around the spectrum in a convincing manner. Those elements meshed together in a concise way and helped give us a good sense of place and events. Audio quality satisfied. Music was bright and bold, while speech came across as natural and distinctive. Effects seemed accurate and dynamic, with clean highs and deep lows. This was a more than competent complement to the visuals. Among the set’s extras, we get an audio commentary from directo Brad Furman and actor Bryan Cranston. Both sit together for a running, screen-specific look at story/characters/screenplay, locations and sets, music and editing, cast and performances, and related domains. Overall, Furman and Cranston provide a largely good commentary. At no point does this threaten to become a truly engaging chat, but I can’t claim to find obvious flaws in it either. The discussion covers the appropriate areas and does so in a fairly enjoyable manner. Five Deleted Scenes run a total of eight minutes, 52 seconds. These offer character moments that tend to show the impact the job has on the Feds. Though decent on their own, they feel redundant in the context of the broader film. Two featurettes follow. The Three Bobs lasts three minutes, 18 seconds and involves Cranston and former federal agent Robert Mazur. “Bobs” brings us an overview of the various “characters” the movie’s lead needs to adopt. “Bobs” gives us a couple of decent notes but seems too brief to do much. How to Infiltrate goes for five minutes, 51 seconds and offers remarks from Cranston, Mazur, former agents Emir Abreau and Kathy Ertz, and actors John Leguizamo, Benjamin Bratt, and Diane Kruger. “Infiltrate” devotes itself to notes about how the agents do their jobs. Like “Bobs”, this one boasts some good material but its short length harms it. The disc opens with ads for A Walk in the Woods, 99 Homes, Break Point and Knight of Cups. Also from Broadgreen adds promos for Learning to Drive, Last Days in the Desert, I Smile Back, The Dark Horse and Song of Lahore. No trailer for Infiltrator appears here. A story about the 1980s drug trade, The Infiltrator falls flat. It fails to deliver a coherent narrative and it lacks much to make it interesting. The Blu-ray presents good picture and audio along with a reasonable collection of bonus materials. Infiltrator winds up as a snoozer.